Circle time suggestions, outdoor activities, culinary activities, and so much more picnic-themed fun! Word flashcards, a picture clue story, and several other documents that will help you prepare and enjoy picnics galore! (Open thematic poster-Picnics) Print, laminate, and display all kinds of posters. 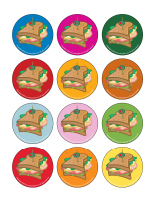 (Open educa-decorate-Picnics) Print, cut out, and laminate. Use the items to decorate the walls of your daycare and set the mood for the theme. (Open models-Picnics) Print. Let children decorate the garland. Cut it out and hang it within your daycare or near your daycare entrance. Create a picnic area in one corner of your daycare. Simply set a large blanket on the floor or, if you prefer, replace your table in your kitchen area with a blanket throughout the theme. This special tool was created in response to a special request received. (Open labels-kitchen area) Print and use the labels to identify items in your daycare. 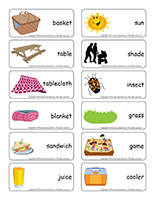 (Open educ-chat-Picnics) Educ-chat is a game which is made up of several different illustrations which represent subjects, verbs, and objects. 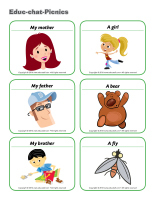 They can be used to help children make complete sentences and enrich their vocabulary. Print, cut out, and laminate the cards. Make three different piles (subjects, verbs, and objects). Ask children to pick three cards, one from each pile. Have them "read" the sentence. The sentences will sometimes be quite silly, but you are sure to have fun. You may also choose to place the cards yourself and have children "read" the sentences. Have you ever enjoyed a picnic? Do you remember who else was there? Where did you go for your picnic? What did your picnic basket contain? Did you play games when you were done eating? Why must we add ice to our picnic basket or cooler? Where would you like to go for a picnic? Can picnics be enjoyed only during summer? 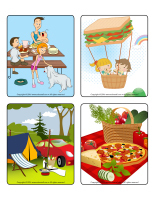 (Open picture game-Picnics) Use the pictures to decorate your daycare or to spark a conversation with your group. Print, laminate, and store the pictures in a Ziploc bag or in your thematic bin. 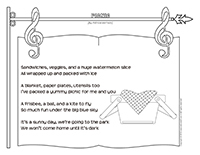 (Open activity sheets-Picnics) Print and follow instructions. 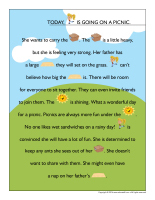 (Open writing activities-P like picnic) Print for each child or laminate for use with a dry-erase marker. (Open stationery-Picnics) Print. Use the stationery to communicate with parents, in your writing corner, or to identify your thematic bins. (Open educa-nuudles-Picnics) Print for each child. Have children color the sheet. Once they are done, they may use Magic Nuudles to turn the coloring pages into three- dimensional works of art. Variation: If you do not have Magic Nuudles, ask children to fill the spaces designed for Magic Nuudles with bingo markers or stickers. To order Magic Nuudles. 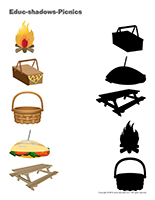 (Open scene-Picnics) Print, laminate, and cut out the items. Children use them to create different scenes. Decorate your area with grass-like carpeting or large pieces of black cardboard to represent asphalt. Blocks of all kinds and, if possible, pieces of wood. They are great for building houses and cabins. Pictures of different types of houses with summer-themed backgrounds can decorate your area. Decorate your area with trees created by children with arts & crafts materials. Children can also add them to their constructions. Use rope or cones to delimit an outdoor construction area. Large Duplo blocks can be used for various constructions. A toy car mat with several toy cars, toy trucks, etc. Various types of paper and cardboard for creating trees, suns, or a summer mural. Empty toilet paper rolls that can be used to create three-dimensional trees. Fine sand that can be glued on drawings to add texture. Seashells also make great additions. Orange and yellow paint for painting a sunny mural as a group. Vegetables (potatoes, peppers, etc.) can be used for prints. Items available in nature collected by children during daily walks. Decorate a shoebox to represent a treasure chest that can be used to collect the items children find during summer months. Use rope or cones to delimit an outdoor arts & crafts area. Large pieces of paper and finger paint or shaving cream. You can also use whipped cream, but it will attract insects. A bin filled with scraps of paper and cardboard along with glue sticks. Children will love tearing the paper and using it for various crafts. Coloring pages representing a variety of summer items. Coloring pages representing various summer sports and activities. Leaf, flower, cloud, and sun stamps and colourful stamp pads. Use rope or cones to delimit an outdoor drawing area. Bring paper and crayons outside and encourage children to sit at a picnic table under a large tree to use them. Transform your area to make it look like a workshop. Simply add tools, construction hats, pieces of wood, a toy workbench, etc. Gardening tools and accessories as well a gardener's costume. Flip flops, scarves, hats, sunglasses, empty sunblock bottles, etc. Beach towels, bathing suits, an umbrella, etc. Use rope or cones to delimit an outdoor role play area. Offer adult clothing items (purses, dresses, scarves, shoes, etc.). A doll/kitchen area can be created using older plastic dishes and dolls. Puppets along with a small theatre. Old bedsheets that can be used to represent a cabin in the woods. Memory game using educatall.com pictures or a summer-themed store-bought game. Orange, yellow, and green modeling dough along with flower, leaf, and animal-shaped cookie cutters. Musical instruments that can be used to create a variety of rhythms (maracas, cymbals, triangles, etc.). Use rope or cones to delimit an outdoor manipulation area. Prepare homemade modeling dough and add it to a special bin along with different accessories (cookie cutters, plastic knives, etc.). A memory game with laminated cards for playing at a picnic table in the shade. Books about summer, summer sports, seasons, rain, sunshine, etc. Camping, flower, or gardening posters. Use rope or cones to delimit an outdoor reading area. Provide books children can look at on lounge chairs in your yard. Summer-themed connect the dot activities. Various activity sheets related to the theme. Use rope or cones to delimit an outdoor writing area. 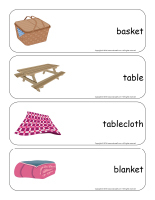 Offer activity sheets children can complete on a picnic table. Use rope or cones to delimit an outdoor motor skills area. Relay races involving buckets of water. Use rope or cones to delimit an outdoor sensory bin area. Create roads for toy cars and trucks. Long jump or high jump. Dig holes in the sand and fill them with water. Use Popsicle sticks to draw in the sand. Hide objects in the sand and encourage children to feel them with their hands and guess what they are. Place your hose inside the sandbox and let children play in the mud. Use rope or cones to delimit an outdoor science area. Blow soap bubbles using a variety of instruments with different shapes and sizes. Blow colourful soap bubbles (see creative recipe). (Open game-This is my spot-Picnics) Print two copies of each illustration. Use adhesive paper to stick one copy of each illustration on the table. Place the second copy in a bag. Children take turns picking an illustration to determine where they must sit at the table. You may also use the illustrations to determine children's naptime spots or their place in the task train. 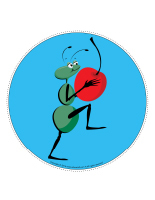 (Open my ant path) Print, laminate, and secure the illustrations on the floor of your daycare to create a path leading to the areas frequently visited by children throughout the day. The path can lead to the bathroom, the cloakroom, etc. If you prefer, use the illustrations to delimit various areas. In your yard, let babies walk or crawl around barefoot. Observe their reactions. Some will love feeling the grass on their feet, but others will quickly want to put their shoes back on. Your sandbox shouldn't be only for older children. Young babies can also enjoy exploring the texture of sand. Set small shovels, spoons, and a few tiny buckets or empty yogurt containers in your sandbox and let them explore. Variation: Why not provide younger children with the opportunity to explore mud too? Simply add water to your sandbox. Visit the Babies and toddlers section on educatall.com. You will find many ways to make picnics fun for younger children. 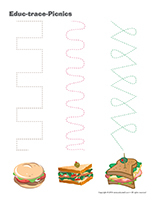 (Open lacing-Sandwiches) Print, laminate, and punch holes around the contour of the shapes. Children can thread string, shoelaces, or ribbon through the holes. Set a picnic basket and a plastic bin on the floor, in front of your group. Fill a grocery bag with a variety of containers and objects. Children take turns picking an item. They must determine if each item is appropriate for a picnic or not and explain why. If the item can be enjoyed on a picnic, they must toss it in the picnic basket. If the item is inappropriate, they must toss it in the plastic bin. For example, if a child picks a can of green peas, he/she could decide to place it in the plastic bin because opening it would require a can opener and we don't usually have one on hand at the park. He/she could also mention that a can of peas must be heated and on a picnic we can't use a microwave oven, for example. He/she could however decide to place the can in the picnic basket, simply because he/she really likes peas. There are no wrong answers. Who says there is only way to have a picnic? Surprise children and organize a different type of picnic every week during summer months. Use a tablecloth, beach towels, or your parachute instead of a traditional blanket. Have a picnic in a gazebo or tent on a rainy day. Organize a picnic in one of your playground structures and pretend it's a boat, an airplane, or a castle. Visit different playgrounds and parks. On a rainy day or a very hot and humid day, plan an indoor picnic. Use blankets to build cabins or simply sit on the floor. Children will love it! Have children decorate a paper tablecloth and use it for your picnic. Organize a picnic in the snow during winter months. Your creativity is your only limit...have fun! Give each child a spray bottle filled with water. Use them for an experiment in your yard. Stand in a sunny location and encourage children to spray water. Observe closely with your group. Children should see colors appear. Use this activity to talk about rainbows. Visit a local park or nearby forest with your group. Bring a beach towel for each child. Take a break and invite children to lie down on a towel, under a large tree. Encourage them to admire the sky and listen to the sounds of nature. (Open picture clue story-Picnics) Print. Sit in a circle with your group. Begin reading the picture clue story. Every time you reach a picture clue, pause to give children the chance to complete the sentence. Ask children to sit in a circle. 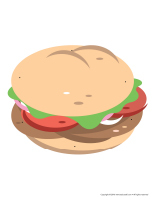 Begin the game by saying, "When I go on a picnic, I pack..." Complete the sentence by naming a food item or game. The child sitting to your right must repeat the sentence and add another item after the one you chose. The game continues. To help younger children, you can place pictures of the items named (or real or toy versions of each one) in the centre of the circle. Using pictures and items will not only inspire children, it will also help them remember the items chosen by others. (Open educ-trace-Picnics) Print for each child. Children must trace the lines using a crayon of the corresponding color and then color the object at the end of each line using the same color. (Open educ-pairs-Picnics) Print. Children must draw a line to connect matching items or color them using the same color. For durable, eco-friendly use, laminate for use with a dry-erase marker. 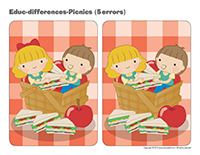 (Open educ-differences-Picnics) Print and laminate for durable, eco-friendly use. Children must identify the differences between the two pictures and circle them with a dry-erase marker. 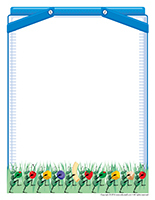 (Open educ-shadows-Picnics) Print and laminate for durable, eco-friendly use. Children must draw a line between each shadow and the corresponding item using a dry-erase marker. Deposit the following items in a picnic basket, cooler, or thermal bag: plastic or disposable dishes, plastic food items, a blanket, plastic insects, an umbrella. Fill a bin with the following items: shorts, tank tops, sunglasses, sunhats, empty sunscreen bottles, water bottles, beach towels, bathing suits, beach balls, etc. Ask children to sit in a circle. Begin the game by saying, "For my vacation, I am packing..." Complete the sentence by naming a clothing item. The child sitting to your right must repeat the sentence and add another item after the one you chose. The game continues. To help younger children, you can place pictures of the items named (or real or toy versions of each one) in the centre of the circle. Picking a picture and spreading them out on the floor will help little ones remember the items previously chosen by others. For this activity you will need dried fruits or dehydrated vegetables (for soup). Place them in clear containers filled with water. Children will experiment dehydration and rehydration. Set apple and orange slices out to dry. Organize a taste test of various dried fruits at snack time. Water your plants with your group to further explore the importance of water. Invite children to drink a tall glass of water to complete the activity. You will need two large vanilla cookies and one chocolate cookie per child. The vanilla cookies will represent the hamburger bun while the chocolate cookie will represent the meat. You will also need yellow and red icing (mustard and ketchup), coconut (onion), and green tinted coconut (relish). You can place the icing in squeezable bottles for added fun. Children will enjoy preparing their sweet hamburger cookies and most of all...eating them! Spread cheese spread, cream cheese, or peanut butter (beware of allergies) on celery stalks. Add raisins or sunflower seeds to represent ants. Serve as a snack. Cut thin watermelon slices. Provide cookie cutters children can use to create fun shapes they can eat at snack time. There is nothing better than a picnic at a local park or even in your yard. Invite each child to bring a food item from home to share with the group. Allow children to prepare their own sandwiches. (Open puppets-Picnics) Print and cut out. Stick a Popsicle stick behind each figure to create puppets. Have children decorate them with various arts & crafts items. 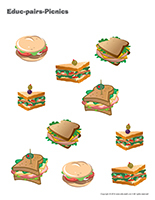 (Open stencils-Picnics) Print and cut out the various shapes. Children can use them to trace and paint a variety of items related to the theme. Have children glue the tablecloth on the green grass before gluing the glass and paper plate on top. 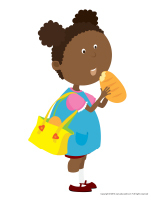 Provide magazines and catalogues children can use to cut out different food items they wish to add to their picnic. They can glue them on their plate, inside the glass, or on the tablecloth. If your group includes younger children, cut out several food items ahead of time. They can simply pick the ones they prefer and add them to their picnic. Set a large white paper banner on a table (or a white paper tablecloth). Ask children to paint different designs on it to create a special tablecloth that can be used for a picnic. 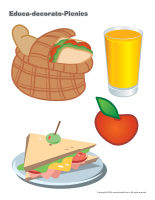 Hang a large white paper banner on a wall and encourage children to create their dream picnic. Provide different materials, catalogues, magazines, crayons, etc. Set a large white bedsheet on the floor and invite children to draw on it with fabric markers. If you prefer they can also use fabric paint. (Open circle bear) Print for each child. Children must cut out the circles and glue them on a piece of paper to create a bear. The smallest circles can be used for the ears and paws. The medium circles will represent the bear's head and the larger circle will become the bear's stomach. If you choose to use the black and white option, children can color their bear as they wish. Variation for younger children: Cut the circles for them ahead of time and simply encourage them to glue them on a piece of paper. (Open my miniature bear) Print, cut out, and color the various parts. Have children glue them on empty toilet paper rolls to create miniature bears. If you prefer, you may also use disposable drinking glasses. (Open creative coloring-Picnics) Print for each child. Have children complete the drawing as they see fit. (Open complete the drawing-Picnics) Print for each child. Children must draw the missing items. 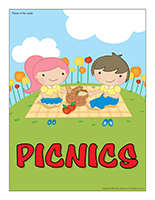 (Open scrapbook-Picnics) Print this new page for each child. Add it to their scrapbook. If a child does not have a scrapbook, visit the scrapbook section on educatall.com. 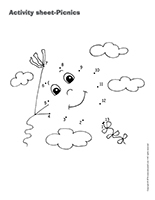 (Open coloring pages theme-Picnics) Print for each child.